MODULAR HANDPIECES The De Soutter Medical osteodriveTM is a versatile modular electric instrument system for small bone surgery. The handpieces are powered by a high performance, dual socket power supply providing greater surgical control and precision. MCI-270 With mini sagittal saw attachment MCI-270 With rotary bur and detachable lever MCI-270 With wire driver attachment Lever extends for optimal ﬁnger positioning Order code Power supply See page 6 for Power Console and Footswitch. See page 7 for sterilisation system. 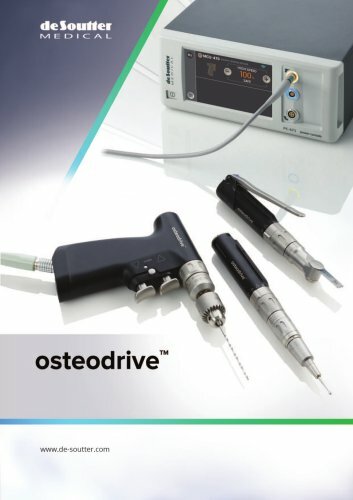 osteodrive MCU-470 With quick release drill attachment osteodrive MCU-470 With quick release sagittal saw Handpiece Order code Speed Cannulation Power supply See page 6 for Power Console and page 7 for sterilisation system.